Imagine waking up each morning with the tranquillity of loons calling. 250 feet of serene waterfront, located on Wilson Pond (3.5 miles long), & a huge wrap-around deck to enjoy it from. This Non-Smoking, cedar chalet has whirlpool baths three of its' bathrooms. A fully-equipped kitchen overlooks the great room and two-story fieldstone fireplace. Tongue and groove cedar interior. Sliding glass doors surrounding deck, including from the master bedroom. The view of the lake through each room is spectacular. Wilson Pond is a very clean and quiet lake 3.5 miles long, great for swimming and fishing! 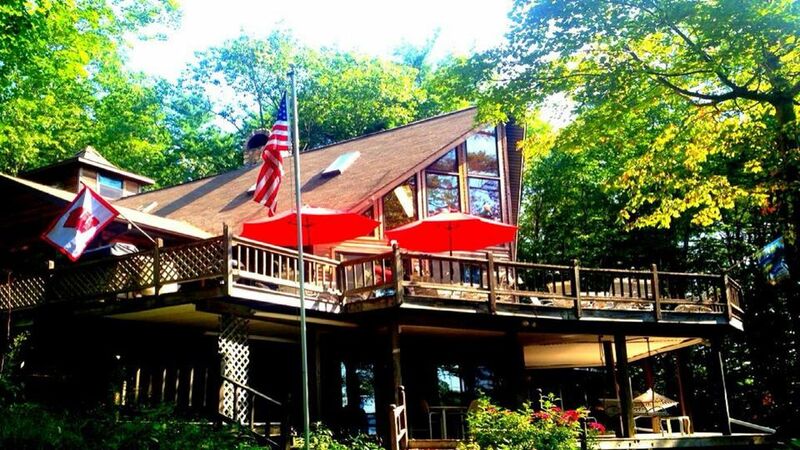 The Chalet is located one mile down a private road surrounded by 120 acres of wooded property. Includes dock and a large float with waterslide. Also includes patio furniture on upper & lower decks that can handle 30 people comfortably. Enjoy your meals in the dining room overlooking the beautifully glistening lake or on the decks. Includes FREE use of 10 kayaks, 6 paddle boards & two canoes. Pontoon boat rental (SEATS 17 )at $1250.00 per week with Mercury 4 Stroke Engine. (4 Stroke engines burn straight gas. NO MIXING OIL IN GAS). Book now availabilty is limited and rents quickly in the spring and summer months! If you like what you see book now before your availability is gone!!! We will book up to 24 months in advance if desired. My father was from Maine. We would come to Maine for summer vacations. Our favorite Aunt had a cottage on a small island. We would stay there with many of our cousins. Just had such great Maine memories had to get a place for my family. Built the Chalet in 1994 with a friend from Wisconsin who I grew up with. He brought his crew and constructed the Chalet on Land my grandfather owned. Traveled to Maine from Madison, Wisconsin with my family for many summers. Now the kids grown up they still come to Chalet for summer vacations. I built the Chalet on land my grandfather used to pasture his cattle on in the 1920's. He would cut timber and use it to build our relative's houses. In addition, he would cut ice out from the lake and he stored it using saw dust in the ice house at his farm in Leeds, Maine. He would sell the ice in the summer months to cool milk. Quiet and peaceful setting with great scenery. MANY ACTIVITIES ON SITE. FULL SIZE BASKETBALL COURT & TENNIS COURT, GAME ROOM, VOLLEY BALL, TETHER BALL, HORSESHOES, SWIMMING, WITH WATER SLIDE OFF PIER DOCK FLOAT, CAMP FIRE BY WATER WITH PLENTY OF FIREWOOD, KIDS PLAYGROUND, TREE FORT WITH WALK AROUND DECK, LOFT & ELECTRIC LIGHTS!!! 4 baths 3 have whirlpools built in. 6 foot glass enclosure keeps you warm. CHALET HAS SAND BEACH WITH SAND LAKE BOTTOM & GRADUAL WATHER DEPTH WHEN WALKING IN. Just 2 miles to Quaint Village of Wayne. Wayne has OLD TIME GENERAL STORE with wine, beer and small grocery items. Has great HOMEMADE BAKERY!!! Fresh bread, Cookies, etc. Great PIZZA & sandwiches. QUAINT VILLAGE WITH GREAT GENERAL STORE & Artesian, Antique shops. 100 FEET FROM LAKE. LAKE & WATERFRONT GREAT FISHING FOR LARGE & SMALL MOUTH BASS, BROWN TROUT, LARGE WHITE PERCH, PICKEREL & OTHER PAN FISH. WILSON POND 3 1/2 miles long. GREAT FOR ALL WATER SPORTS, WATER SKIING, KAYAKING ( FREE USE OF 10 KAYAKS, 6 PADDLE BOARDS, 2 CANOES ) GREAT CRUISING SHORELINE VIEWING LOONS, EAGLES & WILDLIFE!!! Sandy Beach!!! Gradual lake entry depth. Beautiful view of the lake with many vistas. Nice SANDY BEACH FOR LITTLE ONES with gradual water depth. MT. PISQUAH JUST ACROSS LAKE. GREAT HIKING TAILS WITH WILD BLUBERRIES FOR PICKING. JUST 100 FEET FROM LAKE AND SANDY BEACH!!! main floor bedrooms have window air conditioners. Walk out level will remain cool if you leave sliding patio doors closed. one furnace main floor one furnace lower level. Plenty of towels provided & bed will be made up before your arrival. Please bring your own beach towels. (2) one gas dryer main level & one gas dryer lower walk out level. Plenty of parking including large vehicles. EASILY PARK & TURNAROUND 40 FOOT MOTORHOMES. CHALET DRIVE IS LARGE LOOP AROUND. MOTORHOMES PARK BY LARGE SHED IN WOODS OR LOWER DRIVE BY CHALET & LAKE. Please bring your own beach & swimming towels. Please be sure to leave ours when departing for the next family after you. Thank You!! Plenty seating 14 Main Level house. Plenty seating 14 Lower level. Where many families watch movies or kids play electronic games (supplied by you). Lower deck seats 30 & rain proof from deck above. (2) One in Main Level Kitchen & one in Lower Level Kitchen. (3) 3 Refrigerators with ice makers PLUS STAND ALONE 200# ICE MACHINE IN GAME ROOM. MAIN LEVEL Professional Viking 6 Burner Gas with Double Ovens one being Convection & Stove Top Griddle. Bunn commercial makes 1 to 3 pots of coffee in main level kitchen & two coffee makers in lower level kitchen. you will have plenty of dishes, etc. Won't need to bring anything!! VIKING 6 Burner Stove with Griddle, With 2 Ovens with one being Convection PLUS micro-wave, 2 Waffle Griddles, 2 coffee brewers, 1 4 slice toaster, plus every utensil, pot, pan you will ever need!!! (2) Located in main floor Great room Television with DVD & also Lower level Television with DVD in entertainment room with wood burning stone fireplace & kitchen. lake walkout. Yes a few. Bring your favorites or rent them in Winthrop about 6 miles away. Large yard with volleyball, horse shoes and playground. Nice fire pit with log benches at waters edge and plenty of firewood. Nothing like smores by the campfire & GHOST STORIES!!!!! FREE 10 KAYKS, 6 PADDLE BOARDS, & 2 CANOES included with rental!!!! Bring your own. Trails on Mount Pisquah just across lake. Be sure to hike up to the top and go up in fire tower for a great view. Pontoon Boat 28 foot for rent $1250.00 weekly. No daily rentals. Seats 18. 110 Horsepower VERY QUIET Mercury 4 Stroke engine. Burns just gas. NO OIL MIXTURE NEEDED. (2) upper & Lower Deck can comfortably handle 25 People each. Lower deck is rain proof & has a hanging glider chair. Water slide off Large dock float off pier. Fun Fun Fun!!!! PLUS FREE USE 10 KAYAKS, 6 PADDLE BOARDS & 2 CANOES. We installed a SportCourt in 2013. FULL SIZE BASKETBALL COURT with 50 INCH GLASS BACKBOARDS. REGULATION TENNIS COURT. BRING YOUR OWN RACQUETS & BALLS. Playground for children tree fort, swings, slide, merry go round, digger shovels(2), plus another treehouse in the woods with loft and deck, Volleyball, tetherball, horse shoes, FULL SIZE BASKETBALL COURT, TENNIS COURT, game room with air hockey, pin ball machines (2), bumper pool, ping pong table, water slide off dock, fire pit by lake with plenty of wood, WATER SLIDE OFF DOCK!!! There are enough activities to keep everyone (all ages!) busy! My family and I stayed there and held our family reunion there. Was an amazing unforgettable week - and this rental was perfect - plenty of room and activities for everyone. We have already booked for next year again. Brooke glad you and the family had a great vacation. Looking forward to seeing you in 2019. If anyone has seen Grown Ups, you will understand. This place was even better than the pictures. We had 24 people in the house, 7 next door, and 5 in another house but we all hung at the chalet everyday. The lake was clear and perfect with tons of fish and of course the daily sighting of an American Eagle! We had 15 teenagers and our friends had 6 little ones and they were all entertained at all times. They were either fishing, swimming, paddle boarding, playing in the game room or playing at the playground. Hannafords grocery store is close by and of course Tubbys and Fast Eddies for ice cream and lobster rolls. We go to Maine every year and find a house to rent but have never found the house that we want to go back to until now. We have already booked next year. Maddie the Howard family are glad your families and friends gathering was a great one. Looking forward to seeing everyone next year. Its always good to have a responsible group!!! The Howard home was more than we expected for our family vacation. The house is fully stocked, sheets, towels, pillows, etc., even the kitchen has essentials and then some, I always bring tons of stuff from home, cheese grater, wine opener, etc., none of it was necessary, they think of everything! This is all on top of paddle boards, kayaks, canoes, pontoon boat (which was great to cruise around in and swim in the pond from), games, grounds, etc. The amount of space in the house was more than we needed, but it was nice to have space to spread out. There was something for everyone to do and the little town of Wayne does not disappoint either. Super cute general store and you MUST go to "Tubbie's" for ice cream, we admittedly went more than once. Mr. Howard was available on a moment's notice for questions and guidance while we were there. Terrific experience and super grateful that we had the time together as a family. Thank you from the Doug & Stacy Gooding & Family, Beverly, MA. The word wonderful fall far short in describing this place for terrific vacation. The house, the boats , the fishing ,the lake, the trails, the hills , the streams and every other activity you can imagine are here .Most of all the love of our 16 member family.All came to this beautiful Howard's home and everyone loved it so much.The memory created by this week together is forever affixed in time. We are very glad to hear the Keller family had a great vacation. We hope to have the Keller family return again. From age 2 to 78, all loved our family vacation week. This remote place was perfect for our extended family of 24, 11 of them children under 7. No neighbors were close by to be disturbed by the 6 two-three year olds that took turns with crying. The playground swings and merry-go-round were used daily. We enjoyed practically everything:canoes, kayaks, water slide, pontoon boat, game room tennis court, basketball court, volleyball, and the campfire area for S'mores. The lake was comfortable for swimming(not too warm or cold in mid-August) and the islands fun to explore. I loved the loons, easily seen and heard. The kitchen was convenient with plenty of dishes to feed the gang. The chalet was clean with comfortable furniture and plenty of room to spread out or be together. Lee Howard, owner, was easily reached during the week, and eager to make sure we all had a good time. We would definitely return. We are glad your family enjoyed the Chalet for your vacation. Glad to hear the little ones made use of the playground. Sounds like your family really got out exploring in the Kayaks. Come see us next year. This was a perfect location for our family reunion! All the amenities we could ask for were there, especially for our 11 young grandchildren. It was just a ball the whole time and would definitely go back again. I loved the remote woodsy location, and listening to the loons. Access to the lake with the available kayaks and pontoon boat was really the highpoint. Our athletic family requires a variety of activities and they were all there!! I loved that we didn't have to leave the property for anything except food. Glad to hear your family enjoyed the Chalet and all it offers. FULL SIZE OUTDOOR BASKETBALL COURT, TENNIS COURT bring own racquets & balls), Tetherball, Volleyball, Badminton. Playground with swings slide tree fort, HOWARD PARK little kids love playground. Don't CONFUSE playground tree fort with the LARGE TREE FORT IN WOODS by big shed. NO REFUNDS ON DEPOSITS OR RENT FOR ANY REASON!!! NO REFUNDS ON DEPOSITS OR RENT FOR ANY REASON!!! NO REFUNDS ON DEPOSITS OR RENT FOR ANY REASON!!! NO REFUNDS ON DEPOSITS OR RENT FOR ANY REASON!! !